Gay Meyer inspired professionals to use servant leadership as key to overcoming imposter syndrome during May’s Professional Women’s Alliance. Gay Meyer, assistant vice president of HR operations at USAA, is all too familiar with impostor syndrome and has worked tirelessly to overcome it. 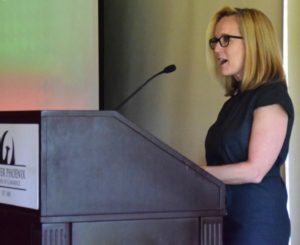 During May’s Professional Women’s Alliance luncheon, Meyer offered insight into how professionals can overcome impostor syndrome and continue to see success. Overcoming impostor syndrome is an ongoing challenge. Meyer suggests professionals of all levels focus on their strengths and celebrate milestones and achievements, regardless of size. This helps professionals recognize the great work they do and minimize the negative effects of setbacks. She suggests reframing setbacks as opportunities and visualizing successes. Sharing difficulties with a trusted mentor, friend or partner can help identify causes and subsequently help professionals rise above challenges. Creating a fan list or group of people who support, admire and keep you accountable helps professionals remember that they are not alone on their journeys to success. Servant leadership makes all the difference when trying to beat impostor syndrome. The next Professional Women’s Alliance luncheon will be on Tuesday, June 13, featuring the 2016 ATHENA Award recipients, Catherine Alonzo, Rebecca Clyde and Dr. Maria Harper-Marinick. The accomplished trio will share experiences and knowledge on the three pillars of being an ATHENA – leadership, mentorship and community service. Register today!